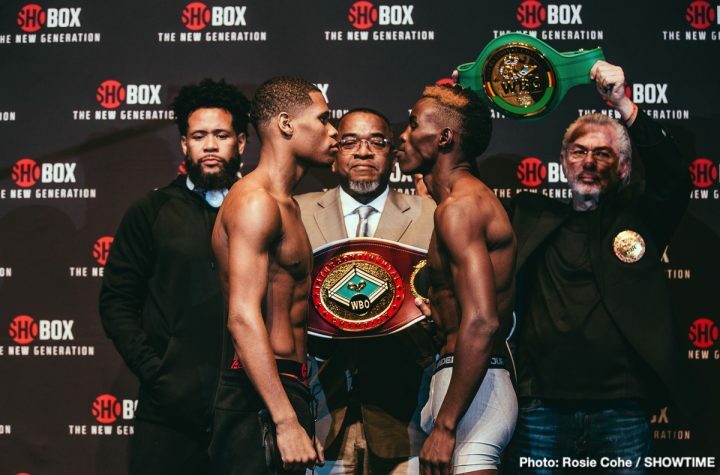 Unbeaten lightweight and rising star Devin Haney and fellow undefeated Xolisani Ndongeni both made weight just a day before their ShoBox: The New Generation 10-round main event headlines a tripleheader live on SHOWTIME (10 p.m. ET/PT) from StageWorks of Louisiana in Shreveport. 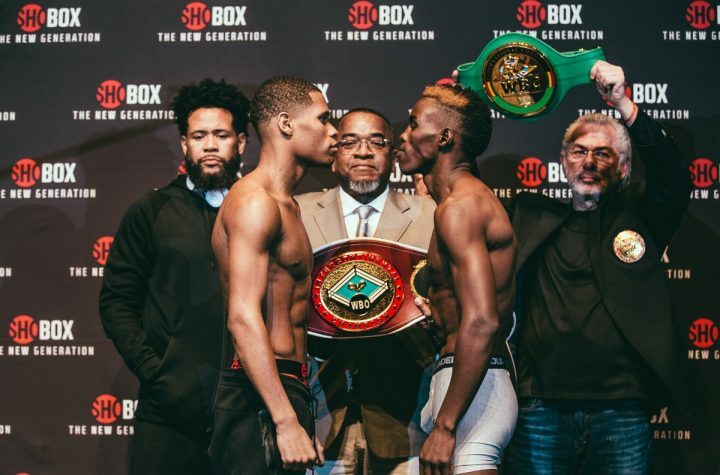 The precocious Haney (20-0, 13 KOs), a seven-time national junior amateur champion who turned pro at age 17, headlines on ShoBox for the third time when he takes on South Africa’s 28-year-old Ndongeni (25-0, 13 KOs), who like Haney is unbeaten and spent four months training at the Mayweather Gym in Las Vegas in 2017. 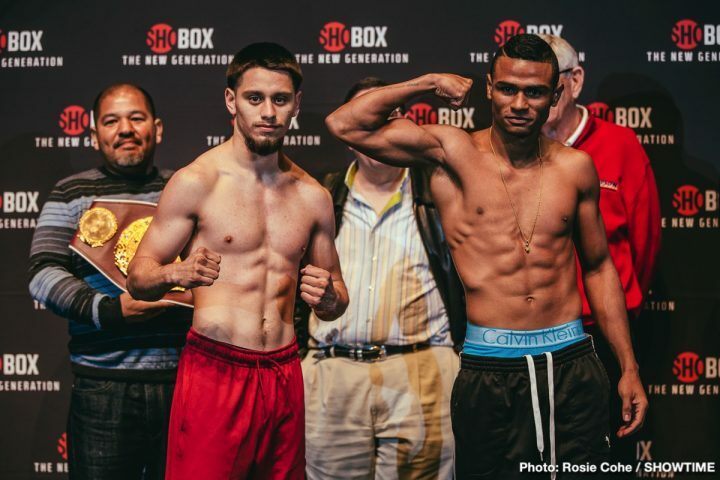 In the ShoBox co-feature, featherweight prospect Ruben Villa (14-0, 5 KOs) of Salinas, Calif., will take on Ruben Cervera (10-0, 9 KOs) of Colombia in an eight-round matchup. 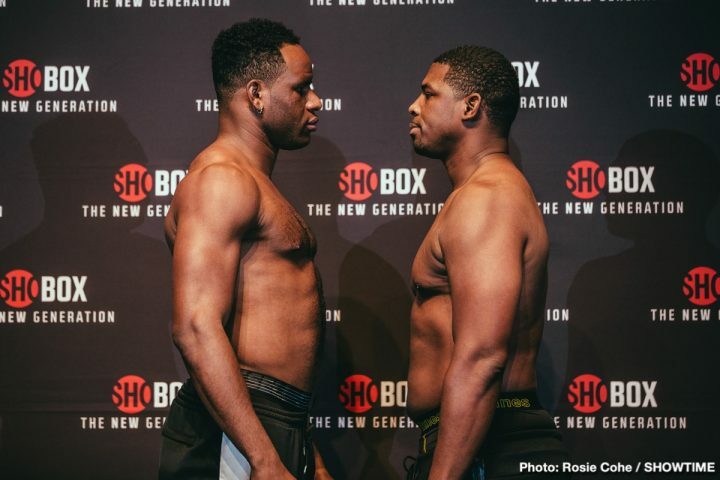 The telecast will open with young heavyweights Frank Sanchez (10-0, 8 KOs) of Cuba and former college football player Willie Jake Jr. (8-1-1, 2 KOs) of Indianapolis, Ind., squaring off in another eight-round bout. All the fighters weighed at Paradise Theatre located inside Margaritaville Resort Casino. 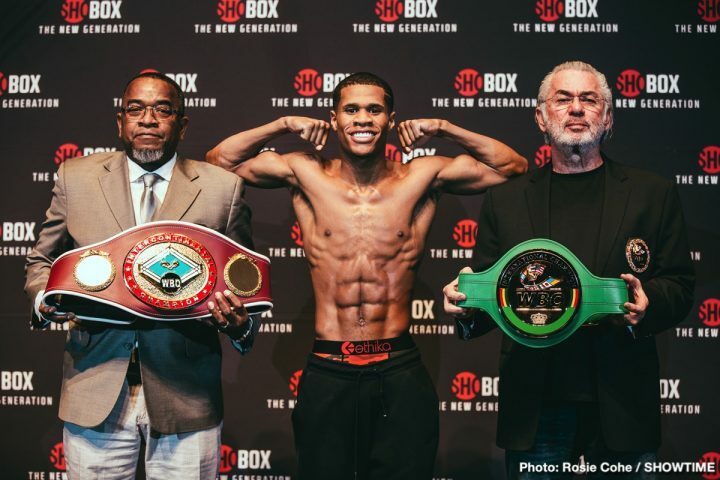 Devin Haney – 134 ½ lbs. 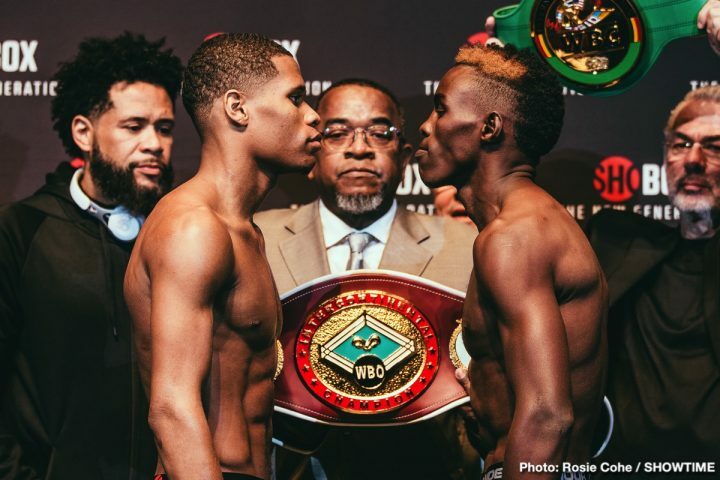 Xolisani Ndongeni – 134 ¾ lbs. 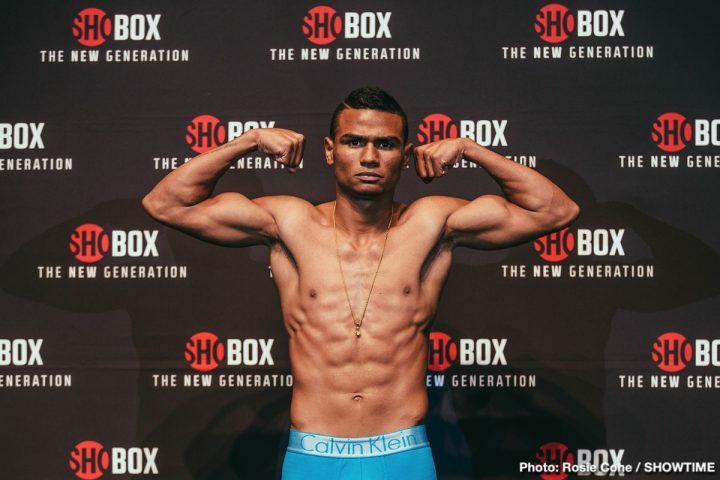 Ruben Villa – 126 ¾ lbs. 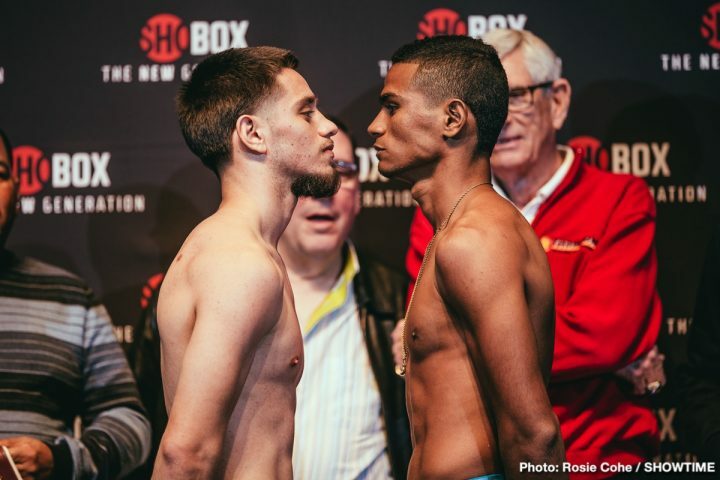 Ruben Cervera – 126 ½ lbs. 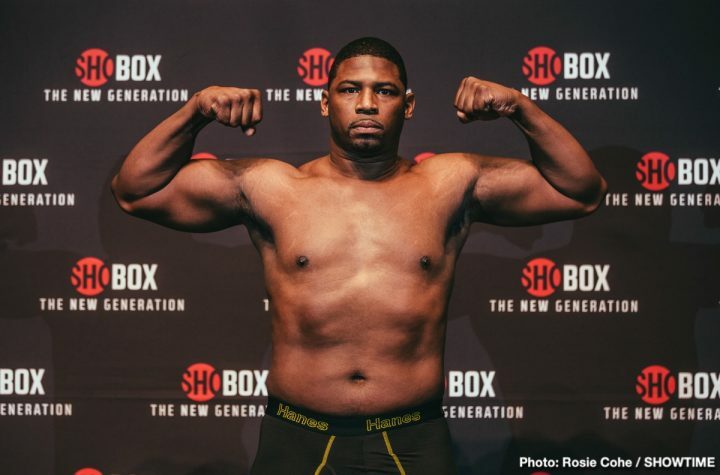 Frank Sanchez – 216 ¼ lbs. Willie Jake Jr. – 239 ½ lbs. 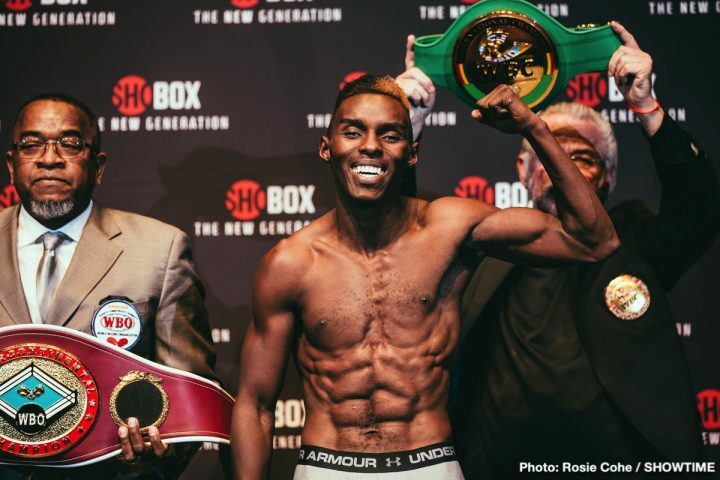 “This is a 10-round fight for the WBO Intercontinental and WBC International belts, so it’s a big deal. This is a true step up for me. “It’s important for me build a name in different areas of the country. I’ve fought in Southern California and Philadelphia, and now I’m fighting in Louisiana. 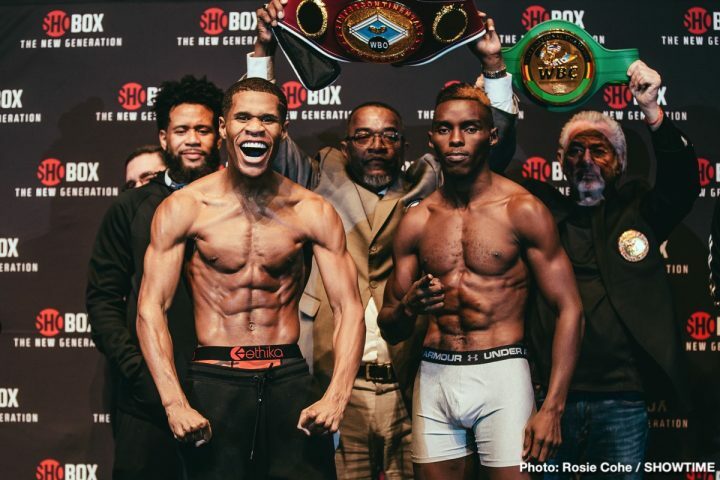 This fight I will show who Devin Haney is. In this fight I’ll showcase my skills and I’ll show my full arsenal. “My style is not a style that people want to fight. I will fight whoever is out there. We haven’t been getting a lot call backs. I’ve had other offers from all the top promotion companies, but I want to remain independent and make my own decisions. “My opponent has an awkward style. I know he has a lot of confidence and he thinks he can beat me. That’s great for him, but he hasn’t faced anyone with my combination of speed and power. “I’ve trained and sparred with guys at Mayweather’s gym in Las Vegas for four months in 2017. I learned a lot got some great experience. 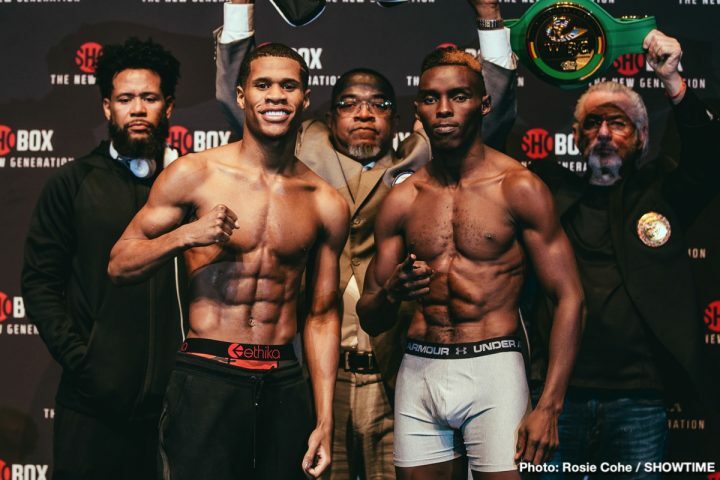 “I see a young, good prospect in Devin Haney. I just have to keep to my game plan. He doesn’t realize how fast I am. I’ll show some different looks, and know what he’s planning to do. Whatever Haney brings, I’ll adjust. “I’ve been in some deep waters and I have more rounds than Haney. That experience will pay off for me. “I’ve been knocked down once in my career. It was early and I came back to knock him down five times and won the fight. “This is exciting and what we’ve been working toward. The contracted weight is 128 for this fight, but I’m a natural featherweight at 126. I’m a southpaw but a natural righty. I throw a lot of jabs, that’s my style. 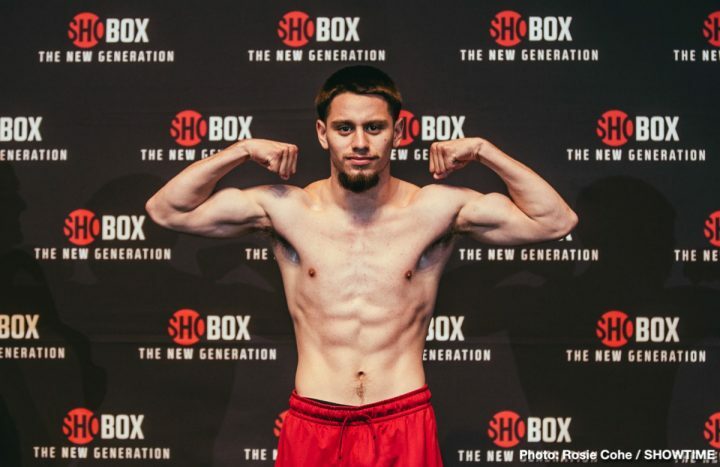 “I’m representing Salinas and want to be a world champion someday. 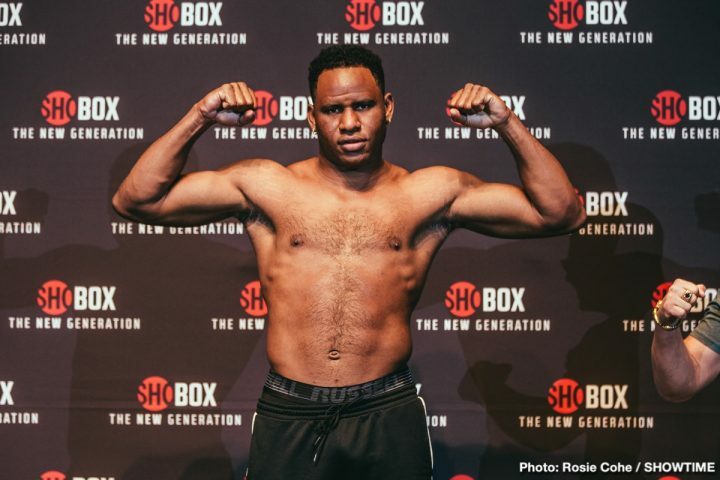 I’m only 21 years old, and to already be fighting on ShoBox is a dream come true. “People say I don’t have the knockouts, but it’s in my mind and they will come. The power and knockouts will come. 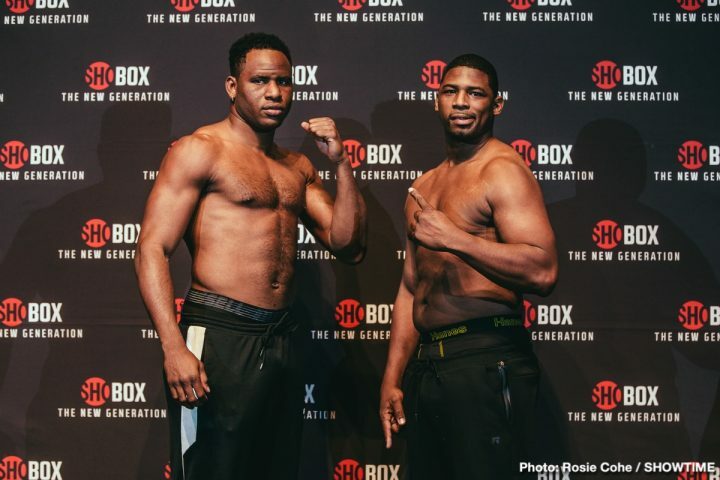 “I once beat Devin [Haney] by unanimous decision in the amateurs. I was 15, and it was in the finals of the Junior Olympics. Devin’s real slick and aggressive and he moves well. That’s how you beat him. “I’ve never been to the U.S., and I love it here. The press conference and the amount of attention this fight is getting is amazing. I’m used to watching this kind of stuff on T.V. But my mind is totally focused on this fight. “I have power in all my punches. I’m a strong fighter who has to take a step up in my career. I’m young, only 20 years old, so I’m anxious to get my career going. “I know Villa is a southpaw. I’ve fought lefties several times in my career and have had no problem with it. “I’m 6-foot-4 and use my height to my advantage. I defected from Cuba in 2016 and my family is still in Cuba. My brother is the only one here in the States with me. “I’m living in Miami now and training there. That will be my home base now. “I’d love to fight [Deontay] Wilder. I want to be world champion so maybe someday I will. His technique is a little bit wild. “Indianapolis is a tough town to be a boxer because there’s not a lot going on there. “I played college football [for Pasadena City College] but I hurt my wrist and decided to go into the military.